Michael Palm's 2004 Edgar G. Ulmer: The Man Off-Screen covers the life and career of the director of The Black Cat (1934), Detour (1945), and many other films. Ulmer had a gift for making the most of low budgets and short shooting schedules. Palm's documentary, though, paints an unflattering picture of this under-appreciated director. Although filmmakers such as Roger Corman (top still) and Peter Bogdanovich (middle) describe Ulmer's influence on independent and B-movies, the film calls into question, without resolving, some of Ulmer's claims about his early work with European filmmakers such as F.W. Murnau, G.W. Pabst, and Fritz Lang. John Huston's Let There Be Light (1946), narrated by his father, actor Walter Huston, is a very polished film (no camera shake, no natural lighting) compared to most documentaries. 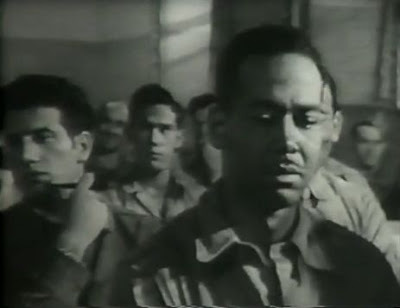 The film follows the arrival, treatment, and release of a group of shell-shocked veterans at an army mental hospital. Let There Be Light was withdrawn by the US military for about 35 years -- it started to be shown in the early 1980s. 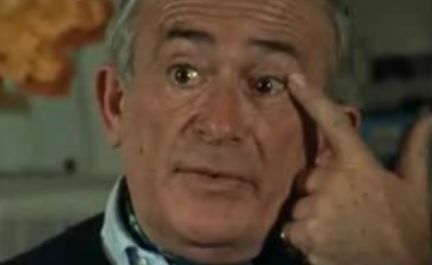 It strangely resembles another black and white documentary (also unseen for years) about a mental institution: Titicut Follies, by Frederick Wiseman. In both films, groups of unhappy men sit and stare, everyone is chain-smoking, and in psychiatrist-patient encounters, the doctors show the same arrogance. 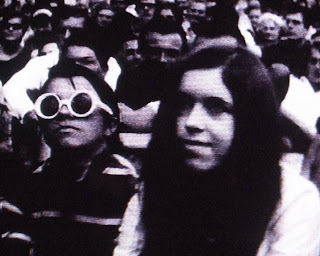 F for Fake (Vérités et Mensonges), a 1973 documentary by Orson Welles (top still), is a fractured and non-conventional personal reflection on truth and lies. Welles uses footage from other films in a deliberately piecemeal telling of the story of two professional phonies: Howard Hughes hoax-biographer Clifford Irving (middle) and art-forgery maestro Elmyr de Hory (bottom). 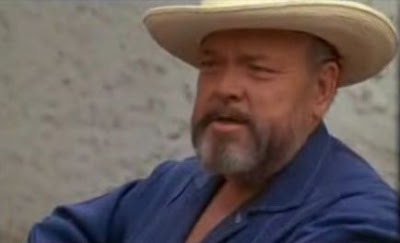 Welles seems to assume that the viewer already knows all about his rather pompous subjects. Orson Welles himself has tremendous charisma when he's on the screen: the viewer endures Irving and de Hory in order to enjoy Welles's sarcasm, anecdotes, and sonorous rotundity when he puts himself front and center. Oratorio for Prague (Oratorium pro Prahu), shot in 1968 by Czech director Jan Němec, was suppressed by Soviet authorities; it's still hard to find. 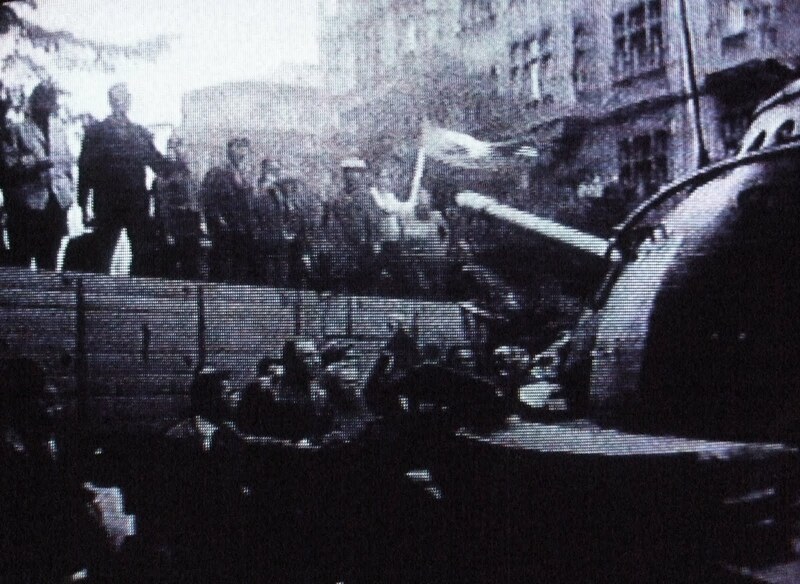 Němec and his crew shot astonishing footage of Soviet tanks and troops invading Prague. 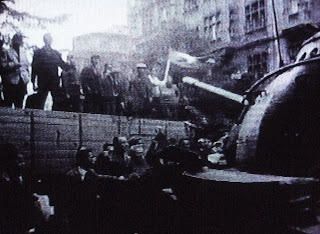 The citizens gather and a few are killed by the soldiers, and some of the tanks are put on fire. Němec also shows idyllic scenes of the Prague spring, including some sort of hippie festival. Humphrey Jennings made Fires Were Started (1943) as a staged reconstruction of the London Blitz of the fall of 1940, when German planes dropped bombs every night on London. The film may have originated as a propaganda piece, but it works well as a procedural document of how a trained team of men attack a devastating fire. 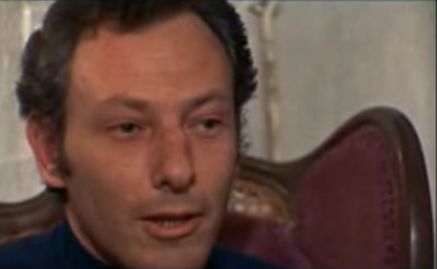 Jennings worked with actual firemen, whose good humor and tenacity strengthen the film. Along the way, the men recreate a daring rescue from a collapsing building. Action scenes are cross-cut with women clerks and telephone operators playing out their supporting roles (bottom still). Jennings's close-in shots show the growing exhaustion of the firefighters, who, during the Blitz, often worked 24 hours straight to prevent the spread of fires from building to building (top two stills). Dziga Vertov's 1934 propaganda film, Three Songs About Lenin (Три песни о Ленине) delivers unabashed hero worship of the already-dead Lenin (he died in 1924). 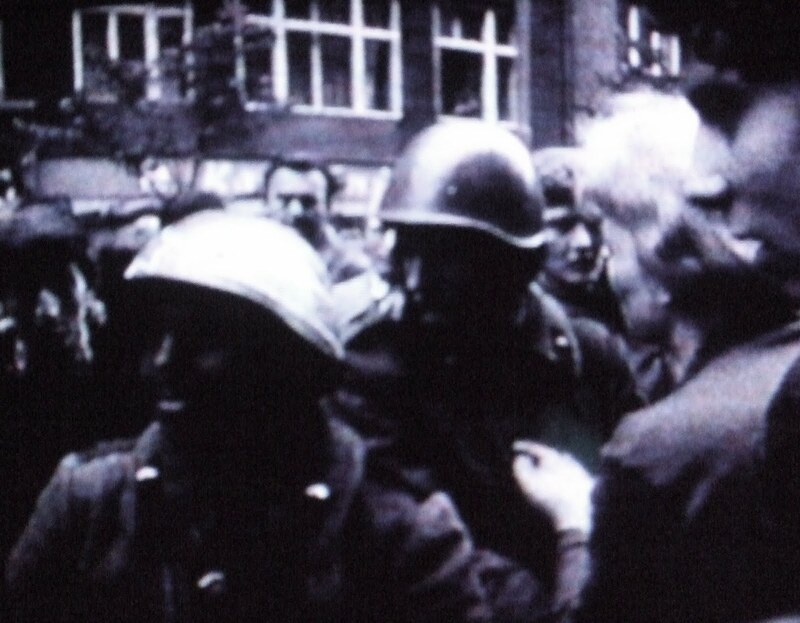 Vertov uses and reuses his precious few frames of blurry archival footage of Lenin himself. The film is also a pretext for an upbeat message about the Russian revolution's progress and the pride of individual workers. "If only Lenin could see us now" seems to be a near-universal wish. Mayor of the Sunset Strip, by George Hickenlooper, was released in 2004, although shooting started years earlier in 1997. The film has plenty of period photographs and engrossing archival footage of rock bands during its subject Rodney Bingenheimer's heyday (editor Julie Janata seems to have found every frame of Rodney, Zelig-like, in the company of music industry giants.) The film also develops two secondary characters to an unusual degree in biographical documentary. 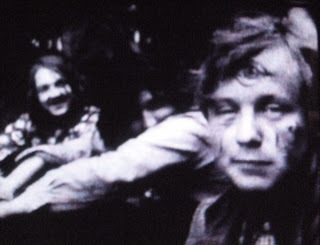 These two, Ronald Vaughan (middle still) and Kim Fowley (bottom still) set Rodney's rather gentle and at times pathetic character in sharp relief, because they are, in comparison, portrayed as deeply repellent figures. 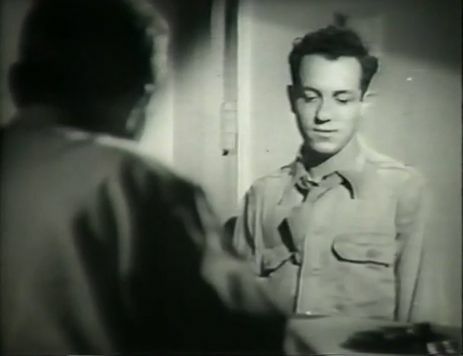 A Diary for Timothy (1945), by Humphrey Jennings, is a propaganda period piece that, seen today, convincingly transmits the brave face worn by Great Britain despite the pain and sacrifice of World War Two. The film's narration, by E.M. Forster (spoken with tenderness and occasional irony by Michael Redgrave), is an essay on "The Future" addressed to a newborn baby (top still) who was born in September 1944. Forster's commentary is punctuated by a series of BBC bulletins about the war's progress. The film dramatizes the contributions to the war effort made by several invented characters, among them a coal miner, a farmer, and a war-bruised soldier. Basil Wright, who had made films for documentary icon John Grierson, was the producer. Tony Gatlif's Latcho Drom (1993) is a visually dramatic portrait of Roma culture. Performances of songs, instrumental music, and dancing seem staged for the camera in collaboration with Romany groups in India, Turkey, Eastern Europe, and Spain. The value of the film is in its celebration of Roma cultural expression across several continents; don't expect interviews or historical context.